PM10 – SAP PM training – Plant maintenance in SAP basic course - ITICA s.r.o. SAP PM training offer (Plant Maintenance SAP training) – Maintenance management for users and key users of SAP basic course. From the SAP specialist training company ITICA. We also focus on Industry 4.0 Plant Maintenance principles: ITICA implements CMMS software Productoo connected to SAP, compliant with Industry 4.0 principles. 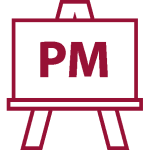 You can learn more about PM Controlling in PM20 – Plant Maintenance Controlling course.